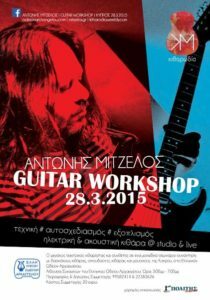 ANTONIS MITZELOS, a great electric guitarist and composer, visits Cyprus for a unique seminar-meeting with guitar teachers, guitar students and musicians, at the Greek Odeon Archangel, on Saturday, March 28, at 3.00pm. He will present and analyze selected topics of technique, improvisation, equipment for both electric and acoustic guitar, with reports and comparisons in live plays, studio sessions and recordings. Duration is 4 hours, with an intermediate break. At the end of the seminar you will be introduced, questions and discussion with the participants. Time: 3:00 pm – 7:00 pm | Participation: € 20.